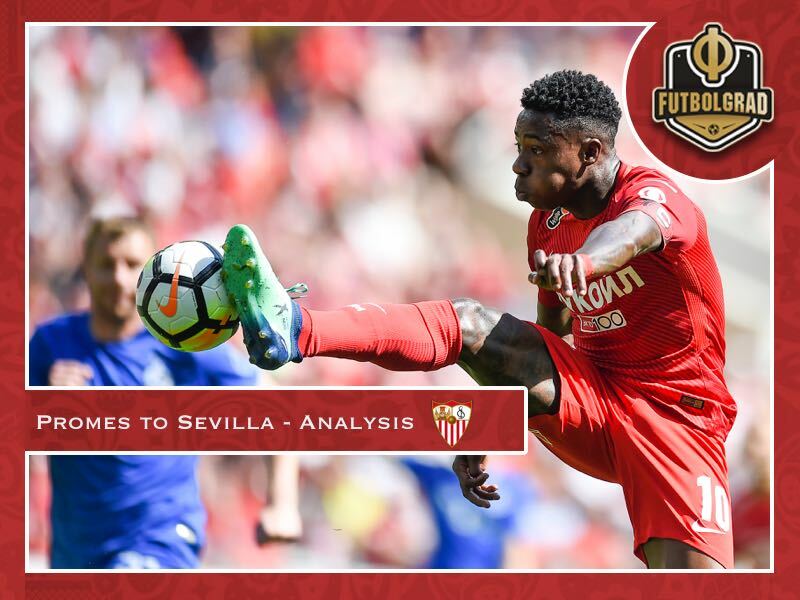 Quincy Promes – What does the transfer mean for Sevilla and Spartak? The rumour started to spread yesterday. After four years in Russia Dutch national team player, Quincy Promes will leave Spartak and join Sevilla for €21 million. On Thursday, however, Quincy Promes cancelled a flight to Sevilla. Football Espana reported on Thursday evening that the Spanish club had failed to meet the 26-year-old’s wage demands. “Fresh reports suggest the player wanted his €3m salary as net and not gross, meaning his agreement with Sevilla has broken down despite a €21m fee being agreed,” Football Espana reported. The demands make sense given that Promes’ salary in Russia is taxed at just 13% and even €3 million net salary would mean a pay cut for the Dutch winger. Promes signed a new contract in the summer of 2016, which, rumour has it, richly awards him with more than €5 million a season—more or less tax-free thanks to the Russian taxation system that categorises footballers as artists. A few hours later, however, the deal was back on. At 23:04 local time Sevilla based outlet Estadio Deportivo released a picture that showed Promes arriving at the airport at Sevilla. It appears that with the deadline looming, and Sevilla looking to sign another attacking player, the Spaniards gave in to Promes’ demands. Promes will earn €3.2 million a year and receive a sign-up bonus of €2 million. Quincy Promes – Why did his value drop? Even at the renegotiated price, Sevilla are given a bargain. Valued €24 million on transfermarkt.de Promes is arguably the most talented player in the Russian Premier Liga at the moment. The Dutch winger was one of the main protagonists in Spartak’s 2016/17 championship-winning season. That season several top clubs from around Europe were interested in the forward, and Spartak owner Leonid Fedun was forced to ask for the exuberant price of €50 million for the forward. That price-tag was put in place to fight off potential interests from the cash-rich English Premier League. It was a strategy that worked. Despite several offers throughout the winter of 2016/17 and then again last winter Promes ended up staying. Going into this season, there were once again rumours. But after turning down offers the last four transfer windows from English clubs the interest in England had cooled down. Now, 26-years old Promes has also been surpassed by younger talent and, as a result, the big money offer from Britain remained to materialise. That price then further dropped with the English Premier League transfer window closing early on August 9. With England out of the picture the transfer market, which has seen a general cooldown this summer in general, Promes’ price also dropped. Finally, failure by the Netherlands to qualify for the World Cup and lack of Champions League football for Spartak this season further dropped the price. Some Spartak fans might be disappointed by the return the club is receiving for the winger. But as sports.ru pointed out in a recent blog post even at just €21 million Promes will become the most expensive player to ever leave Spartak – the previous record is held by Roman Pavlyuchenko, who left the club for €17.4 million to join Tottenham. What sort of player will Sevilla get? Quincy Promes is a dangerous player. The Dutch winger has scored 66 goals and 34 assists in 135 games for Spartak. Operating on either wing a goal every other game is a fantastic return for a player, who played in a league that is not known for its attacking prowess. 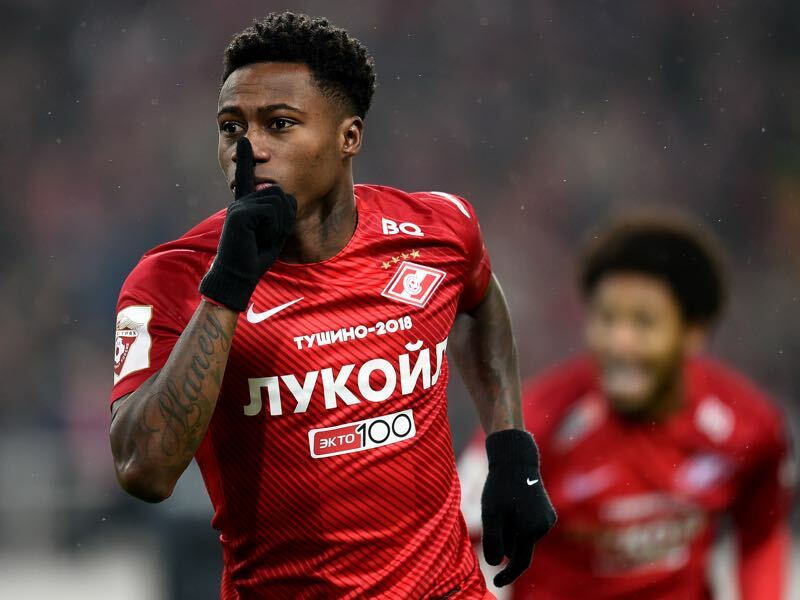 Promes scored 15 goals for Spartak last season, which made him the top scorer of the RPL ahead of Fedor Smolov, who had won the goalscoring title the two previous years while playing for Krasnodar. Scoring 29% of Spartak’s goals also made him the forward with the second biggest contribution rate in the entire league behind Smolov, who had scored 30% of Krasnodar’s goals last season. Furthermore, Promes also added seven assists in his 26 games last season making him the best scorer in league with 22 points, two more than Smolov, who also came second in this category – but while Smolov operated almost exclusively as a centre-forward playing for Krasnodar Promes spent much of the season playing on either wing. As a result, his four shots per game on average, second in the league behind Smolov, highlights that Promes, although he operates as a winger likes to drag to the centre to finish off attacking plays. In that regard, Promes is a classical Dutch attacking winger. Like Bayern’s Arjen Robben the 26-year-old is not glued to the wing when going forward but plays more like an inverted forward, who will break into the centre when his team swarms forward. Operating primarily on the left Promes is two-footed and, as his numbers suggest, has the ability to either finish of an attacking move with a shot by heading to the centre or head down to the byline to cross the ball to a natural centre-forward. When it comes to Sevilla head coach Pablo Machín likes to operate in a 3-4-2-1 formation. Against Villarreal on matchday 2 of La Liga, for example, Machín had new signing André Silva operate as a true number nine with two attacking midfielders, in this case, Pablo Sarabia and Franco Vázquez, operate in support. That sort of setup could work well for Quincy Promes. It allows the creative freedom for the two attacking midfielders to sit a bit deeper in the field, which will enable them to pick up speed in midfield when breaking forward. Perhaps the biggest question mark will be on how Promes will adapt to the new league and a different style of football. While the pace will be a new challenge for Promes tactically, the Dutch winger should be alright as he has now worked two seasons with the Italian Massimo Carrera. Furthermore, the Russian Premier Liga, like La Liga, is defined by its conservative tactical approach with many players playing with three in the back and five midfielders to crowd out the opposition. Quincy Promes was the biggest star at Spartak and losing him will be a big blow for the club. Furthermore, the Russian Premier Liga transfer window closes on Friday at 23:00 CEST. Hence, it will be difficult for Spartak to bring in a last minute replacement. With less than 24 hours to go other clubs will know that Spartak are desperate and will try extract as much, or all, of the €21 million Spartak, received from Sevilla. As a result, the Myaso might wait until the January transfer window to sign a replacement for Promes. Until then expect the likes of Brazilian winger Pedro Rocha and Paraguayan winger Lorenzo Melgarejo to play a bigger role in Spartak’s post-Promes world. Pedro Rocha was brought in last summer with an eye on Promes potentially leaving the club. Thus far the Brazilian has struggled but with a Quincy Promes sized hole in the attack head coach Massimo Carrera is pretty much forced to allot more playing time to the Brazilian.